Dhulagarh is only the latest symptom. I first visited Kolkata as a teenager to watch a Davis Cup tennis match between Australia and India. As we sat in packed stands to cheer a young Vijay Amritraj lead India to a 3-2 win over favourites Australia, a friend spoke to me with awe about a 17-year-old Swedish prodigy called Bjorn Borg who was taking the European tennis circuit by storm: “Mark my words, he’ll win Wimbledon.” Borg duly did two years later at the age of 19 in 1976. Kolkata was then a pleasant city. The Communists had not yet inflicted their cruel depredations on the state. Mamata Banerjee was still a young student leader of the Congress (I). The subject she chose for her masters degree at the University of Calcutta was Islamic history. 40 years later, in her sixth year as chief minister of West Bengal, Banerjee has tightened her grip over the state. 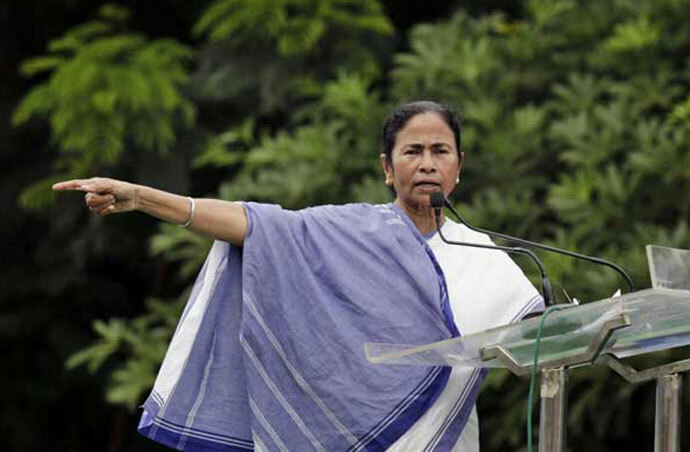 She has done so by polarising West Bengal along communal lines in a manner unprecedented in the state’s history. To consolidate power, the Trinamool Congress (TMC) has torn the secular fabric of Bengal into shreds. Ironically, Banerjee poses as a secular leader while she systematically practises the most cynical and egregious form of communal politics. West Bengal’s Muslims form 27 per cent of the state’s population. Counting Bangladeshi refugees and non-Census citizens, the actual percentage of Muslims in West Bengal today is closer to 30 per cent. Banerjee has collared this vote-bank. She gives it no development but hands it generous sops — ranging from job quotas to hard cash for madarsas. Mamata Banerjee has polarised West Bengal along communal lines. Muslims in Banerjee’s Bengal remain desperately poor and backward. But they vote en masse for her. This 30 per cent vote bloc, along with a smattering of divided Hindus, gives Banerjee a vice-like grip over the electorate. It is hardly surprising that she won the last Assembly election with a landslide. Poverty and communalism are her calling cards. Few outside Bengal had heard of Dhulagarh till two weeks ago. This small industrial and business hub in Howrah district has acquired infamy after Muslim mobs attacked Hindus and burnt their homes. The attack was triggered by a group of Hindus verbally objecting to a procession by Muslim groups on Eid-e-Milad, the Prophet’s birthday. The mainstream media has typically under-reported the Dhulagarh violence. Swarajya magazine recorded the events leading up to the violence: “Muslims brought out a procession complete with loudspeakers blaring Hindi film music on 13 December to celebrate Eid-e-Milad which actually fell on December 12 and was a public holiday. On December 13, Hindus at Dhulagarh village, like in the rest of the country, were observing Margashirsha Purnima. Hindus at the village requested those in the procession to lower the volume of the loudspeaker since the music was interfering with some rituals. If such communal violence had broken out in a BJP-governed state, the media would have front-paged it — and justifiably so — for days. In the case of Dhulagarh, coverage by the media was sparse. It took an outpouring of scorn on social media to spur television anchors and newspaper editors to run stories on the Dhulagarh riot which resulted in horrific arson on dozens of Hindu homes. Dhulagarh is only the latest symptom of West Bengal’s descent into a communal cauldron instigated by violent TMC cadres. If the thuggishness of the CPI(M) was notionally secular, the viciousness of the TMC is unabashedly communal. Riots are its preferred way of life. Banerjee sees herself as a national leader. Like Arvind Kejriwal, Mulayam Singh Yadav and Sharad Pawar earlier, her misbegotten route to the top has been through Muslim appeasement. None of these leaders of straw pause for a moment to think how they could empower, rather than appease, Muslims. NGOs and human rights activists, so quick (again rightly so) to condemn communal violence elsewhere in India, have remained largely silent on Dhulagarh. Bengal deserves their attention.